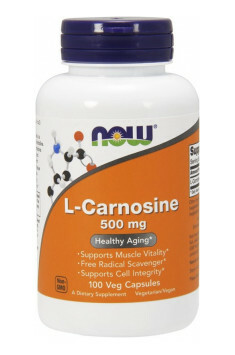 Now Foods, L-Carnosine is a dietary supplement containing a high dose of carnosine – an organic compound found commonly in muscles and the nervous system of mammals. The preparation is recommended especially for individuals doing intensive physical activity. Carnosine prevents the accumulation of lactic acid in muscles, increases their strength and endurance and boosts regeneration. As a result, it can contribute to improving athletic performance. At the same time, it is one of the most effective anti-ageing agents. Anti-inflammatory, anti-diabetic, antioxidant and cardioprotective properties of carnosine help use the supplement for the treatment and prevention of many diseases. Carnosine is an endogenous compound classified as a dipeptide which is a combination of two amino acids: b-alanine and histidine. It occurs naturally in all tissues of the human body – in highest concentrations in the skeletal muscles, cardiac muscle, skin, nervous tissue and brain. Carnosine is characterised by high biological activity, has the ability to cross the blood-brain barrier and is a vital nutrient with very high health-promoting potential. Apart from an extremely positive impact on the body’s endurance and condition, it is a potential therapeutic agent for many diseases induced by oxidative and carbonyl stress. According to many scientists, carnosine does not only slow down but also reverse the body’s ageing process. It increases the length of time between divisions of cells, thereby exteding their lifespan. Carnosine inhibits many processes (oxidation, glycation, shortening of DNA’s telomeres and crosslinking of proteins) which are responsible for ageing of the body. It has been demonstrated in many tests that old cells treated with carnosine are rejuvenated and regain their normal functions. Carnosine is taken eagerly by athletes before an intensive training. It helps to increase physical performance and endurance and also delays muscle fatigue. It contributes to increasing VO2max. Carnosine aids in restoring normal pH balance in muscle cells, consequently reducing pain and speeding up muscle soreness recovery. It can also improve muscle contractility by enhancing the protection from harmul effects of reactive oxygen and nitrogen species and other compounds responsible for cellular oxidation. Carnosine is a strong antioxidant. It removes excess hydroxyl radicals from the body, inhibits the harmful action of singlet oxygen and prevents lipid peroxidation. It is effective both in the case of ROS(reactive oxygen species) and RNS (reactive nitrogen species). Carnosine protects body cells against oxidative stress which is the root cause of many disease entities. It has been proven in many studies that carnosine lowers levels of MDA (malondialdehyde) – the main marker used for assessing oxidative stress. Carnosine slows down protein glycation and inhibits the formation of advanced glycation end products (AGEs). Protein glycation is a negative phenomenon which is a prerequisite for ageing of the body and impairs properties of collagen – a basic building block in the body. This process intensifies at elevated blood glucose levels and can speed up the development of diabetic complications. Glycation consists in non-enzymatic formation of cross links between free amine groups of proteins and sugars. The end products of this process are sugar-protein complexes – the so-called AGEs. Carnosine binds to their structure and promotes their breakdown. Antioxidant, anti-inflammatory and antiglycating properties of carnosine has many benefits for the heart and cardiovascular system. It reduces the risk of developing such medical conditions as atherosclerosis, coronary artery disease, also known as ischaemic heart disease. It has been demonstrated that carnosine contributes to decreasing “bad” LDL cholesterol levels. It may also aid in inhibiting responses of the sympathetic nervous system responsible for hypertension. Carnosine has a positive impact on the condition of blood vessels. It protects the endothelium lining arteries from damage. It reduces negative effects of low density lipoproteins on endothelial and smooth muscle cells which lead to the formation of foam cells critical to the pathogenesis of atherosclerosis. Carnosine prevents the development of type 2 diabetes. Oral administration decreases blood glucose concentration and improves cells’ sensitivity to insulin. Studies on rodents have demonstrated that carnosine increases the number of pancreatic cells responsible for insulin secretion. Carnosine reduces dangerous effects of elevated blood glucose levels. When taken by diabetics, it protects against acute diabetic complications – nephropathy, neuropathy or retinopathy. It has been proven in the course of studies that low carnosine levels are correlated with some neurological disorders. The compound plays a protective role for brain cells and can prevent neurodegenerative diseases (Alzheimer’s and Parkinson’s disease). Carnosine prevents processes of oxidation and glycation which lead to protein crosslinking. Protein crosslinking has a crucial role in the formation of beta-amyloid plaques vital to the pathogenesis of Alzheimer’s disease. Carnosine protects neurons from damage caused by oxidative damage or ischaemia and toxic effects of some substances (e.g. glutamate). In addition, it has the ability to chelate metal ions. Imbalance between ions of particular metals (mainly zinc) is also seen as a factor in the development of neurological conditions. To sum up, L-Carnosine is one of the few supplement which improves physical endurance so dramatically, while having a beneficial effect on your health. It is a massive support not only for your muscles but also for the heart and brain. It protects from developing neurodegenerative diseases, cardiovascular conditions and diabetes. Regular supplementation helps to inhibit processes responsible for ageing of the body and reduce their negative effects. Hypromellose (cellulose capsule), Stearic Acid (vegetable source) and Magnesium Stearate (vegetable source).